The trading ship, known as a pink, was used between 1750 and 1850, according to Leith Smith, an archaeologist with the Maine Historic Preservation Commission. 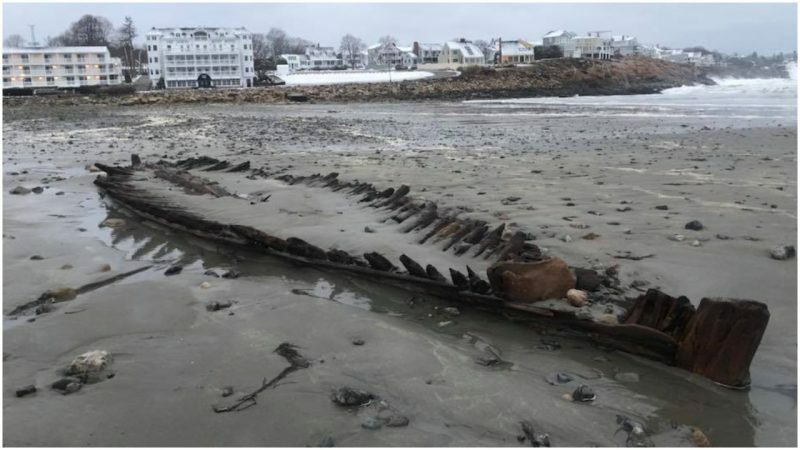 The powerful nor’easter storm, which killed eight people in the United States, exposed this boat when it sucked back the water at Short Sands Beach in York, Maine. Viewing this particular wreck happens about once every 10 years, whenever a big enough storm hits, say media reports. This nor-easter was particularly brutal for the New England States. Flood water rushed through downtown Boston on March 2nd, and over 400,000 Massachusetts customers lost electricity at some point during the storm. The first time that the Maine ship was visible was 1958. But the chances are it was accessible before then because a number of timbers have been hacked away from the wreck, probably used for firewood or for wood for building homes during an era when historical sites and objects might not have conveyed the same meaning and importance. The ship probably carried materials like lumber, flour and raw materials for blacksmiths, with the exception of coal, which was transported on much-larger ships, Smith said. It takes just a few weeks to a month for the wreck to become re-buried and reclaimed by nature, Smith has said. The Maine Historic Preservation Commission determined some of its wood species in 2007 as balsam fir, yellow birch, beech, red pine, and white oak. These are all local trees, making it unlikely it was a ship made in England. The ship has not been positively identified, but it was a sailing vessel with one or two masts—about 60 feet in length. The boat may have been used for more than trading. Sloops played a key role in the early days of the Continental Navy. Armed with cannons and swivel guns, they harassed Royal Navy warships that delivered supplies. One of these sloops, the Success, was involved in one of the first naval battles of the war on May 14, 1775, only 25 days after the opening shots of the Revolution at the Battle of Lexington and Concord. Capt. Nathaniel Pope and Capt. Daniels Egery led a small force in capturing two British sloops and their crews, the Naval History and Heritage Command has written, according to the Washington Post. Overall, the Continental Navy did not experience too much success, because of inexperience in the face of Britain’s world-dominating navy. But Continental ships were able to serve as irritants during the war. These modern storms have been useful to historians and archaeologists who hurry to various sites to document findings and solve mysteries. The early March storm produced another story with ties to the Revolutionary War, hundreds of miles south along the East Coast. A hemlock tree that was possibly transplanted at Mount Vernon in Virginia by George Washington himself was torn apart. The president was interested in trees and plants and “likely directed its planting” as well as its prominent sitting along the estate’s North Serpentine, said a historian at Mount Vernon. Mount Vernon is south of Washington, D.C. The estate sits along the Potomac River, just south of Alexandria, Virginia, and is a popular tourist spot.